How to make an Origami Blow Top Toy! Learn how to make a cool origami blow top! This origami toy can spin around if you blow it. 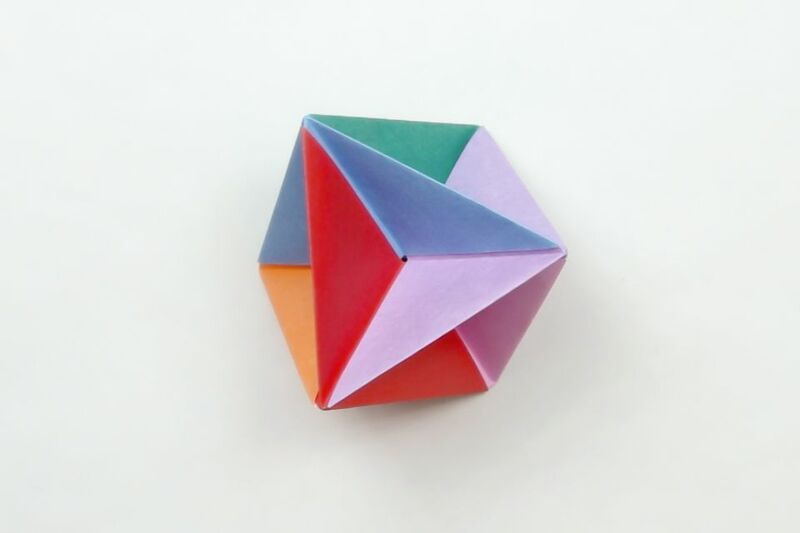 This is a traditional modular origami model, using six waterbomb bases. 1. You'll need 6 sheets of square paper, for this tutorial I used little 3.75 cm squares with a white back. 2. Starting white side up, fold the paper diagonally in half and unfold in both directions so that you end up with an X on your paper. Turn Over. 3. Now fold top to bottom, left to right to create a + on your paper. 5. Make sure your paper is the right way up. 6. Push in the left and right edges. 7. Push the top layer of paper down. 9. You will need to make 6 of these in total! It's helpful to have different colors but you can make them all the same color. 10. Start by holding one in your left hand, and insert the top point into the point of one in your right hand. 11. Now get another one and put its point into the first ones 'pocket'. 12. Put the second ones point into the third ones 'pocket'. 13. This is what you should have. 14. Rotate the model a bit and work on the right side points. Get the forth one and put the third one's point into the pocket. 15. Now put the forth one's point into the second one's pocket. 16. Rotate the model upwards a bit. 17. Get the fifth one and put a point into the fourth ones pocket. 18. Put the first one's point into the fifth one's pocket. 20. Get the sixth one and put a point into the fourth one's pocket. 21. Put the opposite point into the first one's remaining pocket and the other two points go on top of the two leftover points. To make it spin, put 2 points between your index finger and thumb and blow! If you have trouble following these instructions remember that each point goes into a pocket and then the point on either side (of the pocket) must go into a pocket. Origami Sanbo Box Instructions - Easy and Quick for Kids!